Like the Hakka, the Hoklo people are not one of China’s 55 ethnic minorities but are also just a subgroup of the Han ethnic majority. They are sometimes referred to as Hokkien, Hokuro, Min-nan, or Hokkien Lang people and, in the same vein, their language can be referred to as Hoklo, Hokkien, Fukien, Amoy, Minnan, Min, Fujianese, and Taiwanese. However, unlike the Hakka, there is no strong cultural identity linking the subgroups of Hoklo people and they have seemingly failed to hold on to any significant cultural traits. Some people are not even aware of their Hoklo heritage and, to this day, there is no standard Chinese term for “Hoklo”. Since many of them intermarried or assimilated with Hakka people or Taiwanese aborigines, the term “Hoklo” became more of a linguistic heritage. Their language is a branch of Min-nan or “Southern Min” Chinese, which is a dialect that is mutually unintelligible to Eastern Min, Standard Chinese, and Cantonese. They are believed to have originated from lands bordering the Yellow River in northern and central China, much like the Hakka, and settled primarily in southern Fujian province, although communities of Hoklo people can be found in Guangdong and Hainan. Nowadays most Hoklo people live in towns and cities, but a few still live in large earthen constructions known as Tulou. 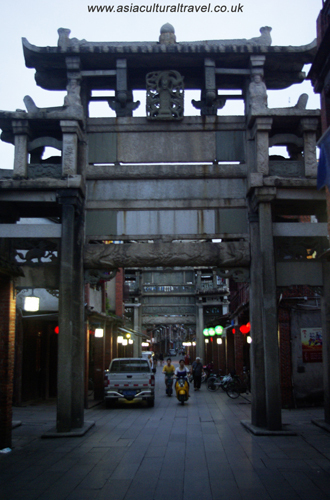 These fortress-like buildings were designed by the Hakka and are usually round or square in shape. They can be several stories high and were initially built to protect inhabitants from bandits and wild animals. Evidently the Hoklo knew a good thing when they saw it, because they took to these safe havens immediately! However, by far the largest constituency of Hoklo people can be found in Taiwan, where they make up 70% of the population and are thus the ethnic majority. Hoklo Taiwanese is a term generally used to mean anyone whose ancestors emigrated from Fujian to Taiwan prior to 1949. In the north and south of Taiwan, there are two marginally different dialects of their language that point to their diverging origins. It is believed that the Hoklo people in the north originated from Quanzhou Prefecture and those in the south originated from Zhangzhou Prefecture. No matter how they got there, the Hoklo Taiwanese have developed their own unique culture that continues to thrive to this day!